“From a young age, I’ve always had an eye for artistry,” says Sola Salons Middletown’s Kristyl Bell, owner of Brows by Kristyl Bell. Her original dream, though, wasn’t connected to the beauty industry at all: Kristyl wanted to be a singer and performer. Growing up, she honed her skills at local talent shows, and she even sang at her high school graduation! “I just knew singing was my niche,” Kristyl says. The aspiring vocalist was right. In the mid ‘90s, she and a friend formed a group called Enchante, and they landed gigs opening for some pretty big names. That’s how Montell Jordan noticed the duo at a venue in Louisville, Kentucky. “He happened to be out and about before his concert, and he heard us singing,” Kristyl recalls. The legendary signer, songwriter and producer – known for his hit 1995 single “This Is How We Do It” – introduced himself, and invited Kristyl and her friend backstage to sign for his entourage. Enchante must have nailed it; Jordan and his crew invited the young women to finish out the tour with him — one featuring Boyz II Men and Mary J. Blige, too. When that tour ended, Kristyl moved to Los Angeles, and signed a deal with Jordan’s management team. Over the next year, Enchante recorded a few demo tapes, and sang in nightclubs around town. In preparation for one of those shows, Kristyl had her brows done; the experience was so awful that it ended up changing Kristyl’s career path entirely. “I’ve always had really thick, full brows, and the first wax job I had came out with horrible, thin lines,” she says. After that, Kristyl – a 20-something with absolutely no experience in waxing – decided to teach herself how to wax so she could do her own brows, and take control of her style. After a year in LA, Kristyl “called it quits,” she says, and moved back home, ultimately landing a job at the Clinique counter in a major Lexington department store. “My passion for eyebrow artistry started to grow while working with many different customers there,” explains Kristyl. When consulting her clients, Kristyl found it virtually impossible to apply makeup without first offering a standup brow shaping. Before long, Kristyl was in the habit of keeping a pair of tweezers in her coat pocket. Technically, she wasn’t supposed to be doing eyebrows — “But,” she says, “Before long people were showing up just to get their brows done.” Customers paid Kristyl hefty tips for her brow work, and that finally got her to thinking about beauty school. After relocating to Louisville, Kristyl enrolled in an esthetics program with the intention of specializing in eyebrows. She graduated in 2008, but didn’t officially get into the industry until 2011, when she quit a corporate job to open her own studio with Sola’s help. “I never had a desire to work in a salon under someone,” Kristyl explains. When she learned about Sola, she knew it was going to be a good fit. Kristyl started her tenure with Sola at its Hunnington Place location, and moved to the Middletown studio when it opened in order to expand her business. “Because it was a brand new location, I was able to design my room from scratch,” Kristyl says. 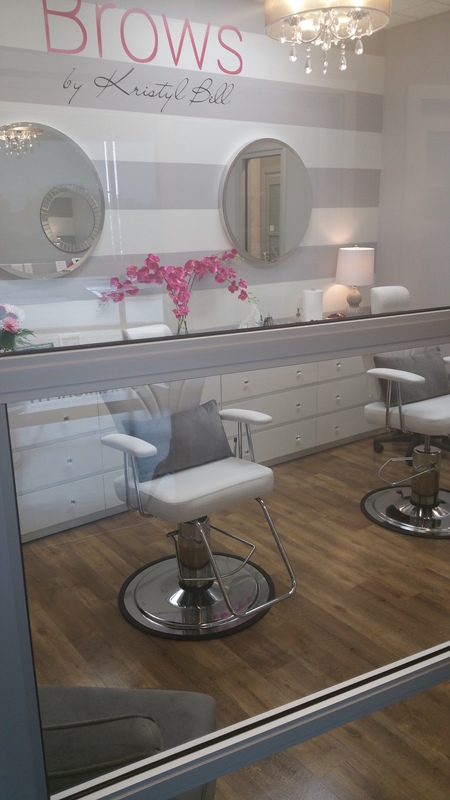 “I wanted my brow studio to look like a brow studio, not a hair salon,” she continues. Kristyl does brows and facial waxing — that’s it. Kristyl’s schedule books two to three months out, and she’s able to sustain a business on a niche set of services by being consistent and, well, exceptional, too. Another point of distinction is the amount of time Kristyl dedicates to each and every client. “At trained shops they want to get you in and out and make money. I don’t do that,” says Kristyl. “I’m offering an exceptional service in a great atmosphere,” continues Kristyl. For a truly custom salon, Kristyl says she “put everything in from scratch,” including the sink, cabinets and mirrors. Kristyl credits manager Tom Beyrer – owner of all three Sola Salons in Kentucky – for her gorgeous studio, and for the luck she had when launching her salon. “He took a chance on me,” Kristyl says, noting, “I had maybe five clients when I opened my Sola because I hadn’t been doing brows professionally yet.” Tom helped her build up a clientele, and within six months Kristyl was able to quit her day job and focus on brows full-time. Business is booming; but, Kristyl’s still found time to offer master brow training classes for other professionals at her salon, and she even gets folks from other states, too. “Chicago, Pennsylvania, Tennessee: That’s absolutely humbling that they would travel so far to take a class with me,” Kristyl says. We aren’t surprised, given this guru’s natural talent, expertise and passion.